Brief warmup before the chill and more rain..
Quick moving front delivers a balst of chilly air along with rain showers Sunday morning. The saying "In Like A Lion And Out Like A Lamb" has really come true for Central Maryland during the month of March. If you can remember we started the month with 2.2" of snow which set the trend for many nearly 20 below average days in the coming weeks ahead. The pattern though has seemingly changed this week for the Baltimore metro the end the month on a milder note. In fact temperatures on Friday reach 70 degrees with highs so far today (Saturday, March 30th) well on there to 80. The last time this happened was 2 weeks ago where we hit a high of 72 degrees on March 14th and a high of 78 degrees on March 15th. We won't be close to any record though but it's at least a sign of things to come especially with 8-14 day long term trends pointing to above average temperature conditions. For now though don't get use to the warmth and keep that winter coat nearby. A powerful cold front Sunday morning looks to kick us back to reality with a few showers and breezy conditions out of the northwest that look to deliver chillier air. Wake up temperatures come Monday morning will be in the upper 20s and lower 30s with highs struggling to reach 50 degrees. By Tuesday, high pressure locks itself to the northeast delivering northerly breezes to the area. At the same time a storm sits down along the coastal Carolinas and looks to ride north with the southern branch of the jetstream. Right now model consensus suggest the storm heads out to sea which means we will likely see cloudy and breezy conditions for much of Tuesday and even Wednesday morning. High temperatures once again will struggle once again to reach into the mid 50s courtesy of the northerly breezes draining down along the mountains. Cold air drains out as winds shift back out of the south Wednesday and skies start to clear. 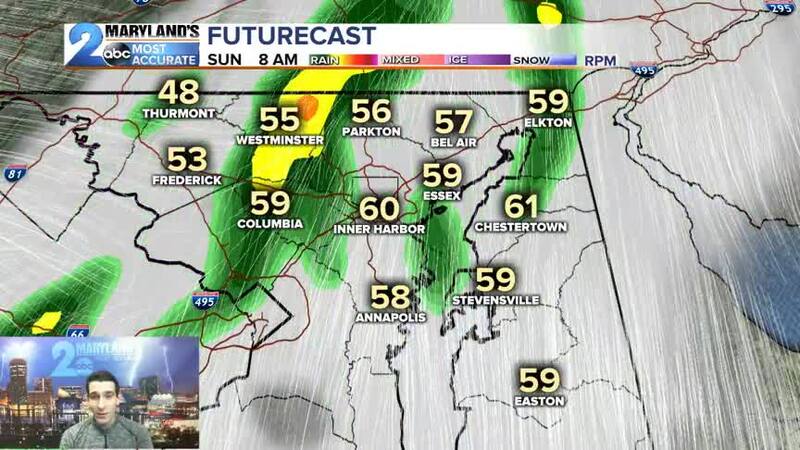 High temperatures return to the 60s with highs near 70 degrees for Orioles Opening Day down at Camden Yards. Next chance for rain arrives by the end of next week.